Automated External Defibrillator (AED) training can help save lives by showing when the use of an AED is appropriate. You may have heard that many bystanders save the lives of cardiac arrest victims using an external defibrillator despite the fact that they have never had any formal training. This may cause people to believe that they don’t need AED training when in fact it is vitally important. Although the use of an external defibrillator can dramatically improve the victim’s chances of survival, this is only applicable if the cardiac arrest has been caused by two types of abnormal heart rhythms. If the victim has already flat lined i.e. there is no heart rhythm, using an AED will not be effective. When you switch on the external defibrillator it will tell you to attach the electrode pads to the patient’s bare chest. Everyone else needs to stand clear so that they do not affect the readings the machine will take. The AED will examine the rhythm of the patient’s heart via these pads and will determine if a shock is required. As we mentioned above, there is no point in shocking a patient when a rhythm cannot be detected. In this case the AED will instruct the first aider to deliver CPR for two minutes before using the defibrillator to recheck the rhythm. CPR especially when combined with heart stimulant drugs can be very effective at restarting a rhythm which can then be normalized using the AED. All AED devices licensed for use in the states will give vocal instructions. Some models also provide visual prompts too which are especially useful if the rescuer is hearing impaired. Most devices cannot be forced to give a shock once the AED has decided that a shock is not necessary. Are automated external defibrillators dangerous? Prior to 2002, automated external defibrillators could cause third degree burns when they delivered the shock to the victim. Some caused the patient’s condition to deteriorate so the manufacturers of these devices have reduced the voltage of the shock that is administered. 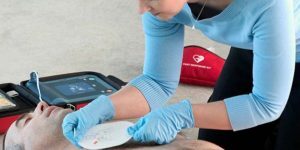 The newer models are much safer to use and less likely to cause any issues especially when used by those who have completed their AED training. The studies have consistently proved that the use of an AED within minutes of someone suffering a cardiac arrest caused by a faulty heart rhythm will dramatically increase that persons chance of surviving and significantly lowers the risk of permanent brain damage. Are the AED devices I buy at Amazon or similar stores the same as the ones used by the emergency services? Generally the automated external defibrillators sold to the general public are not the same as those used by the emergency services although Ambulances and Fire Crews can carry AEDs. Medically trained personnel will use manual or semi automatic defibrillators that are also capable of acting as pacemakers if required. They will do the same tasks as the AED devices designed for use by members of the public but they will also do more advanced procedures and the people operating them are usually trained in reading ECGs etc. Can I be sued if I use an AED on someone? Some bystanders are so worried about being sued; they will not come to the aid of a victim of cardiac arrest. The Good Samaritan laws in most states have been amended to cover those bystanders who do use an AED to treat a casualty. Provided you have used the device correctly you should be protected although you will need to check the legal position in your state. Most automated external defibrillators will record all the actions taken during the treatment and these recordings can be downloaded to a computer. The statistics show that these devices save lives and most people agree that more AEDs should be available. In fact, the American Heart Association and Red Cross have both campaigned for more public access to these devices. Yes! We offer a completely free online AED training course. Once you complete the course you’ll receive a free AED certificate. What are the contraindications of Entonox?